Solicited application for fresh graduates (inexperienced candidate) In the Daly Star of February 03, 2014, Sonali Bank invites application for the post of management trainee. Write an application addressing the Head of Human Resources Department, Sonali Bank, Motijheel, and Dhaka. 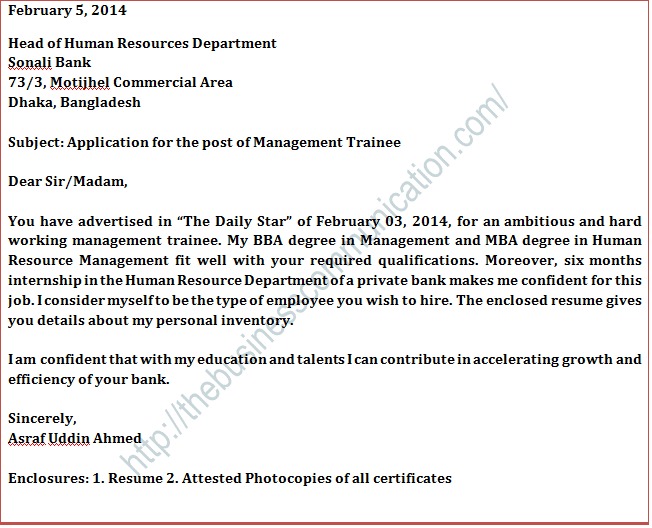 You have advertised in “The Daily Star” of February 03, 2014, for an ambitious and hard working management trainee. My BBA degree in Management and MBA degree in Human Resource Management fit well with your required qualifications. Moreover, six months internship in the Human Resource Department of a private bank makes me confident for this job. I consider myself to be the type of employee you wish to hire. The enclosed resume gives you details about my personal inventory. I am confident that with my education and talents I can contribute in accelerating growth and efficiency of your bank. new reader. What could you suggest about your put up that you just made some days in the past?